DoingTimeWithBernie.com: Is Felon on Probation Bernard Kerik making a living off the 9/11 dead....again? Is Felon on Probation Bernard Kerik making a living off the 9/11 dead....again? Well, fifteen years later, still on U.S. Federal release and facing a combined lingering criminal and IRS debt to society of $1/2 million, felon on probation, Bernard Kerik, has turned from Criminal Justice Reform charities back to cop charities from which to turn some quick notoriety and possibly some serious cash! In between revenge on his many ex-friends who bailed him out of his crimes in the last fifteen years, felon Kerik has begun hawking 9/11 charities in hopes he will be hailed a 9/11 hero this fall on the fifteeth "anniversary" of 9/11 to make the real cash! 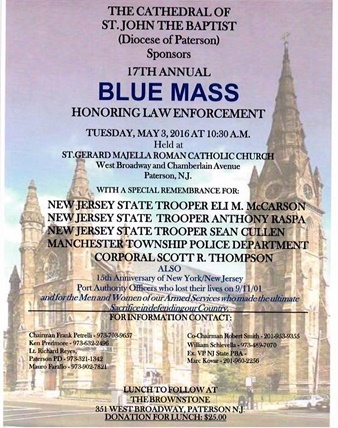 Felon on Probation invites us all to the Blue Mass held on 05/03/2016. 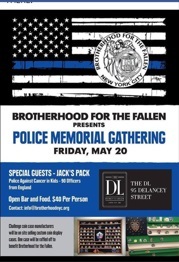 It's a disgrace to real police heroes to have this corrupt cop using their honor for "advertising". Of course there's free eats at "The Brownstone", business of Mr. Caroline Manzo. 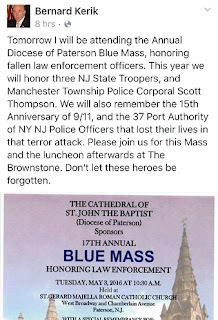 They say the way to a New Jersey State Policeman's influence is through his stomach...Bernie may need a favor some day from one of those cops..like say when felon Kerik may be caught exacting revenge on those ex-friends? Or maybe felon Kerik will need a character reference for the ongoing investigation into Frank DiTomasso's alleged assault on Larry Ray? 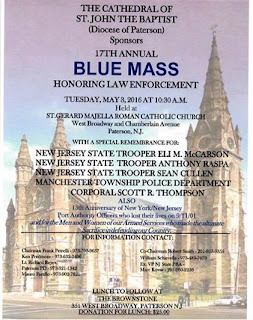 Or many felon on probation Kerik may need a New Jersey State Police Officer to testify at the Joe Tacopina defamation suit? Or maybe, felon on probation, Bernard Kerik may need the New York State Police and NYPD to allegedly taunt and intimidate the Plaintiff-CoAuthor into dropping her lawsuit against him in the Southern District of New York? (Can you say witness tampering?) Nah...now would an eight-time convicted libel-proof felon on probation manipulate people like that? You betcha! 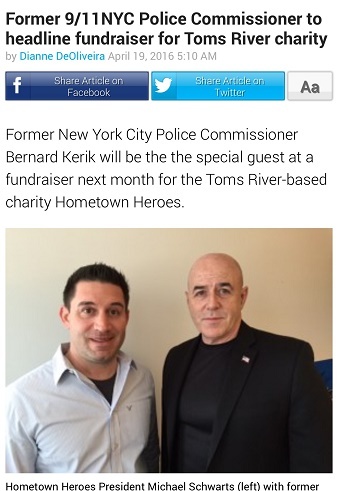 Like "entremaneur" Michael Schwartz, of Jersey, who hires a felon on probation, Kerik be a "special guest" his charity, "Hometown Heroes" Gala on 05/05/16. 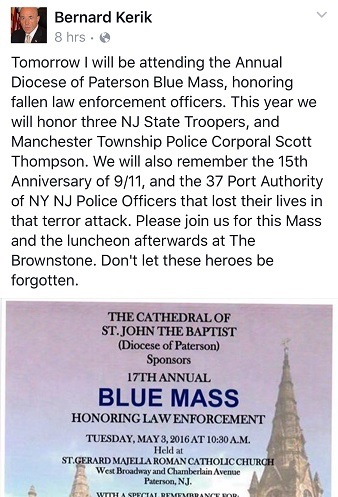 Look like one 501(c)(3) honoring another, doesn't it? DISGRACEFUL. The only thing felon on probation did during 9/11 was to deposit the money from 9/11 appearances in his bank account! The only think felon on probation Kerik did during his service in the Army was to shtup a young Korean woman then desert HER AND HIS UNBORN CHILD FOR OVER 20 YEARS! Yup, a real hero and role model! Shouldn't the U.S. Department of Probation be making felon on probation, Bernard Kerik, get a real j-o-b to pay his FULL DEBT TO SOCIETY instead of all this shtupping, free eats and glad-handing cops? So, history is repeating itself. Felon on probation Kerik is back to his grind of making money off the abandoned baby daughter, the imprisoned felons and the 9/11 dead he left behind. Let's hope history repeats itself again and he returns to prison where he belongs!